We shouldn't begrudge the Trudeaus' childcare staff any more than we should any other household staff or assistants. I hear Sophie Grégoire doesn't do her own vacuuming either! News broke that Canada's new prime minister, Justin Trudeau, has two nannies paid for out of his publicly funded household budget to help care for his three young children. A CBC headline read "Trudeau children's nannies being paid for by taxpayers." The implication is clearly that this in an indulgence. "This confused idea that nannies are an upper-crust indulgence to be sneered at runs deep." It also recounted how Brian Mulroney told a reporter he would not have taxpayers pay for nannies for his kids like Pierre Trudeau did. Mulroney's chief of staff later claimed that Mulroney only had a maid who "interfaces with the children in a habitual way." Oh, well, then. Because of course the prime minister will be given a fully staffed home replete with maids, housekeepers, gardeners, cooks and so on while he is serving our country. We would expect nothing less. But not nannies! Oh, no. Nannies are seen as an elite status symbol in our Canadian imagination. They conjure up ideas of mothers who are too good to care for their own children. They are too busy shopping and lunching (or working to make ends meet, but whatever) to bake cookies and read delightful stories to their kids. Presumably these families are also too good for daycare; their little princesses need to avoid the great unwashed masses of children fighting over puzzle pieces. "The more demanding the parents' jobs, the greater the need for a nanny." This confused idea that nannies are an upper-crust indulgence to be sneered at runs deep. I've talked to several mothers who cast their eyes downward, cheeks reddening, as they admit that it looks like getting a nanny will have to be the way to go. These are mothers returning to work after having their second or third babies and realizing that the cost of daycare for multiple children coupled with the inconvenience of juggling multiple drop-offs and pick-ups simply doesn't make sense. "We never thought we'd be the kind of family to have a nanny," they say. "Isn't it crazy? A nanny! Us! But daycare for three kids actually costs more." Of course it's not crazy. If a household has two working parents, then somebody has to take care of the children. And when daycare costs for a single toddler are $1,676 per month in a city like Toronto, hiring a nanny to care for multiple children at home is a completely reasonable move. I do love one thing about this story, though. 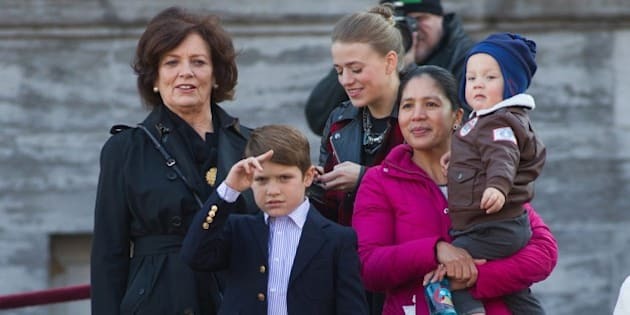 I love that we are seeing pictures of Trudeau's children in the care of their nanny. Usually kids of public figures are kept behind closed doors, taken care of by their nannies (of course). When they are brought out for photo ops with their parents, nannies and caregivers are tucked carefully out of sight. Clearly, busy, working parents cannot also take care of their children full-time. The people who are entrusted with that important job should be lauded for their role rather than shamefully hidden away. This blog originally appeared on Playground Confidential.